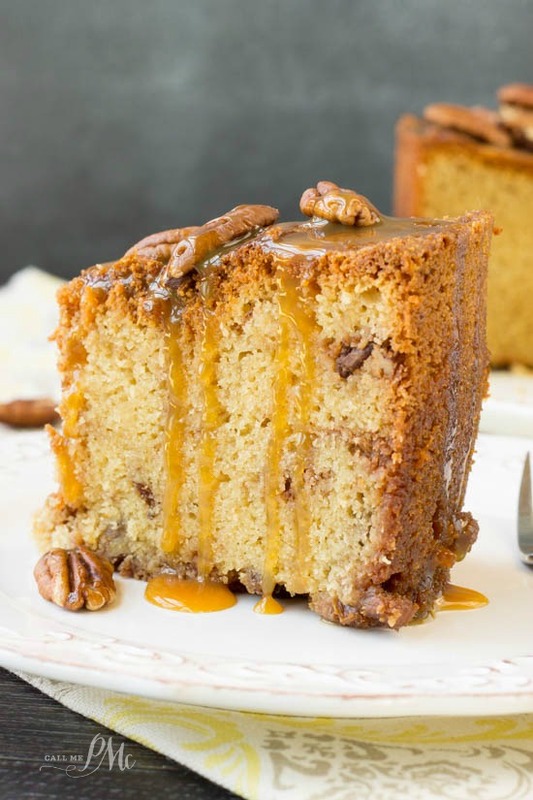 Homemade Pecan Pie Pound Cake Recipe is a soft, buttery pound cake recipe that’s studded with sugared pecans and caramel. 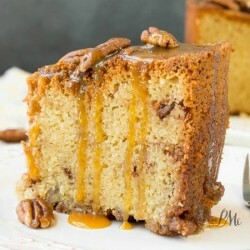 A friend recently asked me if I’d ever made a Pecan Pound Cake. 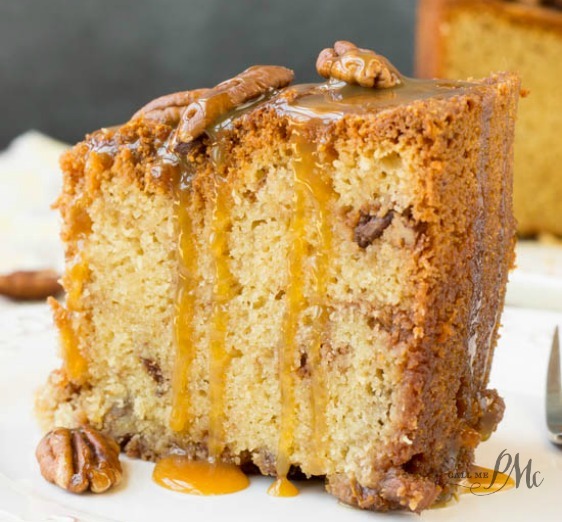 I thought he said Pecan Pie Pound Cake and answered ‘no’, but I was highly intrigued especially since I had just started my Pound Cake Review series. Turns out I couldn’t find a recipe for Pecan Pie Pound Cake. I thought about it for a couple of days and how I could get Pecan Pie flavors in a dense Pound Cake. Now you also may be asking yourself, isn’t a Pecan Pound Cake and a Pecan Pie Pound Cake the same? Well, in my mind they are not. 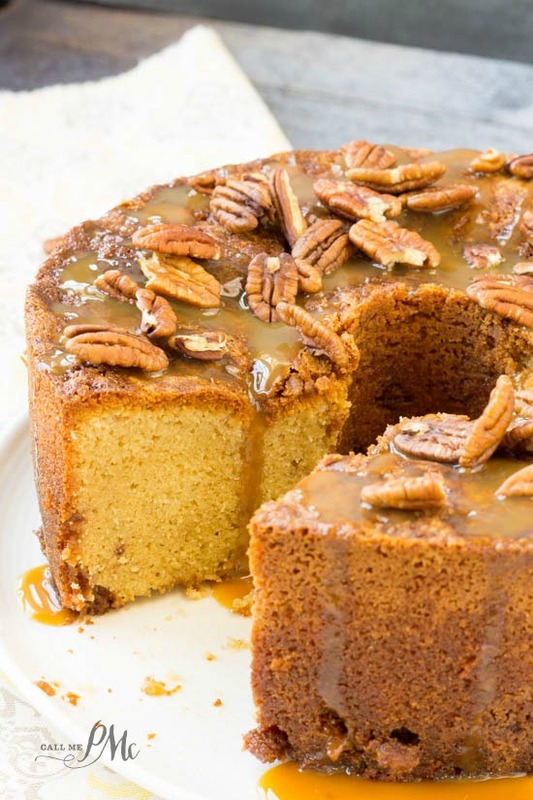 Pecan Pound Cake would be putting pecans in a or on top of a traditional Pound Cake. 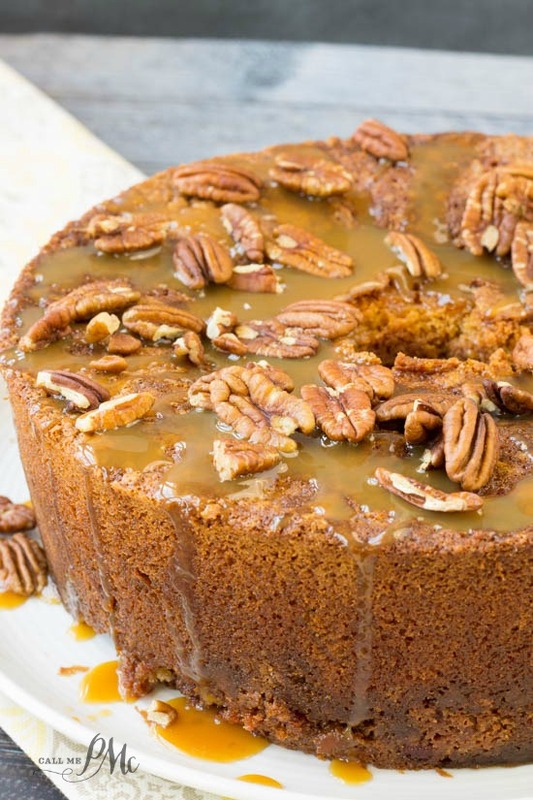 What I want is the flavor, the richness, the gooey-ness of a Pecan Pie in cake form. 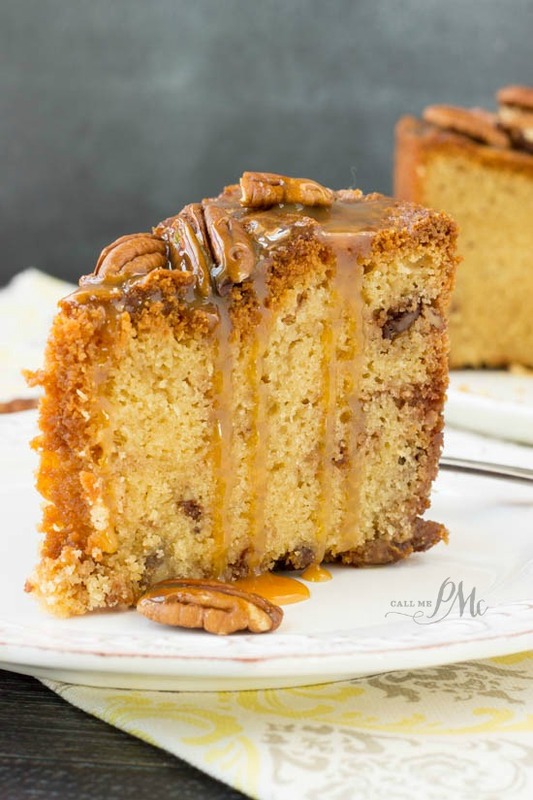 I achieved the flavor combination that I wanted by using brown sugar, toasted and salted pecans, and caramel both in the cake and drizzled over the cake. For my Pecan Pie Pound Cake Recipe I used brown sugar along with granulated sugar. Brown sugar adds a deeper, richer flavor. Think about a chocolate chip cookie (minus the chocolate chips) versus a sugar cookie. The brown color and deeper flavor of a chocolate chip cookie comes from the brown sugar whereas a traditional sugar cookie is made with granulated white sugar. There’s a huge different in taste, right? I also used Sugared Pecans, again to add another layer of texture and flavor. You can use salted and toasted pecans if you don’t want to make Sugared Pecans. The taste will be ever-so-slightly affected so if you have time I highly recommend making the sugared pecans. Finally, to acquire the Pecan Pie ‘gooey-ness’, I used Caramel Bits throughout the batter. (You can also find Caramel Bits in this recipe.) Caramel Bits are chewy balls of caramel ideal for baking in cakes and cookies…. or eating by the handfuls. I don’t judge! Prep your ingredients. Prepare the pan and measure ingredients. Sit butter and eggs on counter to come to room temperature at least 30 minutes. Use real butter. I also find that name brand ingredients make a better tasting pound cake. Use the best vanilla you can afford always. Measure carefully. Extra flour or sugar can make a huge difference when baking. Read this post on how to correctly measure flour. After the oven comes to temperature, place the cake pan in the center of the oven. I always sit my cake pan on a cookie sheet in case the cake overflows. Do not open the oven door to check cake until the very last 5 minutes. This will cause a drastic change in temperature making the cake fall. Test for doneness with a long, thin skewer. When it comes out clean or with dry crumbs the cake is done. Spray a tube pan with non-stick spray or spread an even coat of solid vegetable shortening then dust with flour. Cream butter, shortening, brown sugar and granulated sugar together until smooth. In a bowl, add the all purpose flour, baking powder and salt. Whisk to combine and set aside. Combine whole milk, heavy whipping cream and vanilla in a small bowl. Pour 1/2 batter into tube pan. To remaining batter add pecans and caramel bits, fold to combine. Pour remaining batter in tube pan. 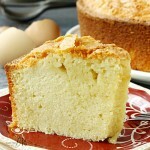 Bake 80 to 85 minutes at 350 degrees or until cake skewer inserted into cake comes out clean or with dry crumbs. Allow cake to sit in pan on a wire rack 20 minutes before inverting on a serving tray to cool completely. 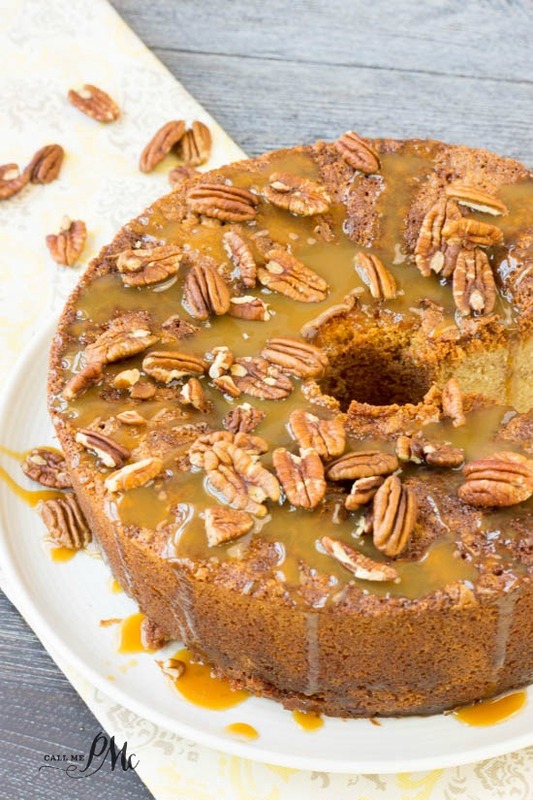 Top with Caramel Sauce and pecans. 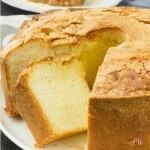 If you like Pecan Pie Pound Cake Recipe, you may also like my Pound Cake series! 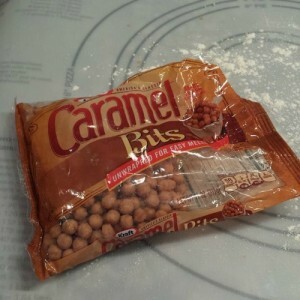 I couldn’t find the caramel bits, so can I use the same caramels that are individually wrapped, and cut them up into smaller pieces? Because aren’t they the same thing? I also had trouble finding the recipe for the caramel sauce. So thank you, I do have a question can these be made into little mini flute cakes? most bundt cake recipes scaled for traditional 10-inch bundt pans make 10 to 12 cups of batter, since a 10-inch bundt ban holds 12 cups. If you are scaling a recipe down for the smaller pans, check to see how many cups the pan holds and scale accordingly. My experience has been that those mini-bundt pans often hold half a regular batch of cake batter, so we will do two batches with one pan.